If you have a houseplant and forget to give it water for extended periods of time what happens? The physical appearance of the plant begins to wither. It shrivels and drys up, loses its color and liveliness, and it eventually dies. Humans aren’t any different than plants in this aspect. Without water, which comprises approximately 75% of our bodies, we would die. Well, humans are different than plants in that we have a much more complicated set of consequences to face if we don’t receive adequate water consumption. Our bodies are like a factory that is constantly maintaining itself and producing things with the help of water as its labor force. If we run low on that fuel it’s imperative that it gets refilled as soon as possible. Without it, we could face minor and major problems such as weight gain, tiredness, asthma, premature aging, seizures, and death. When your body is dehydrated it means that your loss of water has exceeded the intake of water over time. The excessive loss of water within your body isn’t compensated with enough refueling during dehydration and as a result your body pays some hefty consequences. The level of dehydration can range in severity from minor cases to serious health concern, but each instance should be taken seriously and avoided at all cost. Thinking of the factory analogy mentioned above will help make a bit more sense of dehydration. You’ve got a factory that needs a staff to work properly, but what about when certain workers start to skip work? You’ve got a heavy load of work that needs to be done and little to no fuel to do so. As a result the factory falls behind in production and fails. Did you know that we often mistake the feeling of thirst for hunger? So instead of topping up on fluids, we eat; and instead of supplying our bodies with the much needed water, we give it what it doesn’t really want. This can lead to a state of mild to moderate dehydration, and many people suffer from it without even knowing. Every cell in our body depends on water. Water flushes out the toxins as well as fat and is essential for organ function. Not getting enough water can have health consequences and result in an illness. The color of your urine is an important indicator of health. When you drink sufficient amounts of water, your urine is pale yellow. If it gets dark yellow and appears more concentrated, this is a sign you need to refill on water. Also the frequency of urination matters. If you haven’t been to the toilet for 2 hours or more, this means you haven’t been drinking any water and should replenish. Not drinking enough water can also cause a smell of ammonia to come from your urine. The foul odor is produced by chemicals in your urine which become very concentrated due to a lack of water. You may also notice more bubbles in your urine when you pee. Since blood is mainly made of water, dehydration also causes a drop in blood pressure. When you have low blood pressure, you can start feeling wobbly. Headaches are often caused by dehydration (as I mentioned in my article about the top 15 causes of headaches). When the pressure in your blood vessels drops, it makes it harder for the heart to pump enough oxygen to the brain, which results in a headache. It’s also not uncommon to have cognitive difficulties when you haven’t drunk enough water. Brain is made 90% of water and brain cells and nerves react badly to water loss. You can start feeling sluggish, and experience problems with concentration and memory. Lack of water can often result in a feeling of tiredness and sleepiness (as I mentioned in my post about the 6 reasons you are tired all the time). This warning sign, too, is connected with low blood pressure and difficulty supplying the brain with the oxygen it requires. Most people look at athletes that are completely tired out and think that muscle exertion is the only cause of their tiredness. In fact, there have been studies that link athlete exhaustion to dehydration. A person that isn’t drinking enough water is much more susceptible to drained muscular activity because the heart has to work overtime to pump oxygen and nutrients throughout the blood. Recent studies at the University of Connecticut’s Human Performance Lab have suggested links between negative mood swings and a lack of hydration. The results showed that the level of dehydration didn’t even have to be severe to cause a noticeable swing in mood. Needless to say, your body typically won’t let you feel happy if you’re neglecting to give it the fuel it needs. When someone has a low level of water in their system, the blood will most likely begin to thicken. As a result of this, it becomes more difficult for the blood to flow healthily throughout the body. With an increase in resistance comes an increase in blood pressure, a condition frequently linked to heart disease and stroke. Further reading: if you suffer from high blood pressure, read my article how to reduce high blood pressure naturally. Here we see yet another counter-intuitive defense mechanism of dehydration, in which cholesterol levels are raised to keep the cells from losing water. This leads to a spike in cholesterol levels. Further reading: if you suffer from high cholesterol, read my articles about 10 simple and effective ways to lower cholesterol naturally. If your skin feels dry and has lost some of its elasticity, this can signal you’re dehydrated. Drinking water can help you maintain your youthful appearance and keeps the skin healthy and shining. Drinking water gives your body fuel to flush the toxins to keep your skin healthy. Without water, your skin is much more susceptible to unsightly skin disorders such as psoriasis and dermatitis. If you have trouble with constipation, increasing your fluid intake should be the first step and it’s also one of the top 10 natural remedies for constipation. Water helps the food move through your intestines and keeps the digestive tract flexible and clean, so it can perform its function well. Your joints are a complex system that take a constant beating throughout the day. This is especially true for joints that bear near-constant loads of weight such as the knees. Water actually forms a cushion of cartilage that relieves tension in the joints and keeps soreness and stiffness at bay. Further reading: read my article about the best spices and herbs to relieve joint pain and how to use them. Dehydration is commonly mistaken for as hunger. People don’t realize that their body is asking them for water and they turn to food instead. With a combination of low energy and a low metabolic rate as a result of water deficit, weight gain is a likely consequence of dehydration. Further reading: find here 12 simple tweaks for weight loss and great health. Further reading: read my article about 15 common habits that can damage your kidneys. If you have kidney problems or your urine is too concentrated, urinalysis may show up that there are too many crystal substances in your pee. A study on the effects of dehydration on marathon runners found a higher concentration of urinary salts in urinalysis. Urine tests of marathon runners 11 days after racing showed elevated levels of oxalate dihydrate crystals in urine. Water is still your best bet. You can also get some fluids from food – fruits and veggies with high water content include watermelon, cucumbers, grapes, carrots and cabbage. Vegetable juices, flavored water, herbal teas and clear soups are also a good source. Fruit juices are high in fructose and has none of the fiber that real fruit does, so should be consumed in moderation (try blitzing your own juice using a lot of veggies and a hint of fruit). Also, when you drink black tea and coffee, don’t forget that these beverages make you pee more (they are diuretics), so they don’t help much with your rehydration efforts. 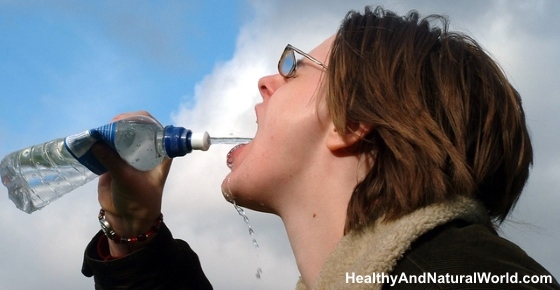 A lot has been written about the health benefits of drinking water. It seems these days that more and more people carry bottled water everywhere they go. Each day we lose large amounts of water from sweating, breathing, urine and stool, and these water losses must be replaced daily to maintain a proper function of our body. When your water intake is below your water output, you can become dehydrated. A rough indicator is that the human body is made up of 2/3 water. * The proportion of water in the body, shown as a percentage of body weight. The importance of water is also featured in my e-book about superfoods and how they can improve your health, which is part of my Natural Health Revolution Program. This program will help you to achieve your health, nutrition and weight loss goals. Everyone knows the advice of drinking eight 8-ounce glasses of water (or fluids) a day which is nearly 2 liters, but your needs really depend on several factors, such as your physical activity, your health, what you’ve eaten, your overall mass, your health, age, the climate you live in, so you will need to modify your water intake depending on these factors. Which Is Better: Drinking Cold Or Warm Water? I have no idea – I haven’t heard about such a thing.